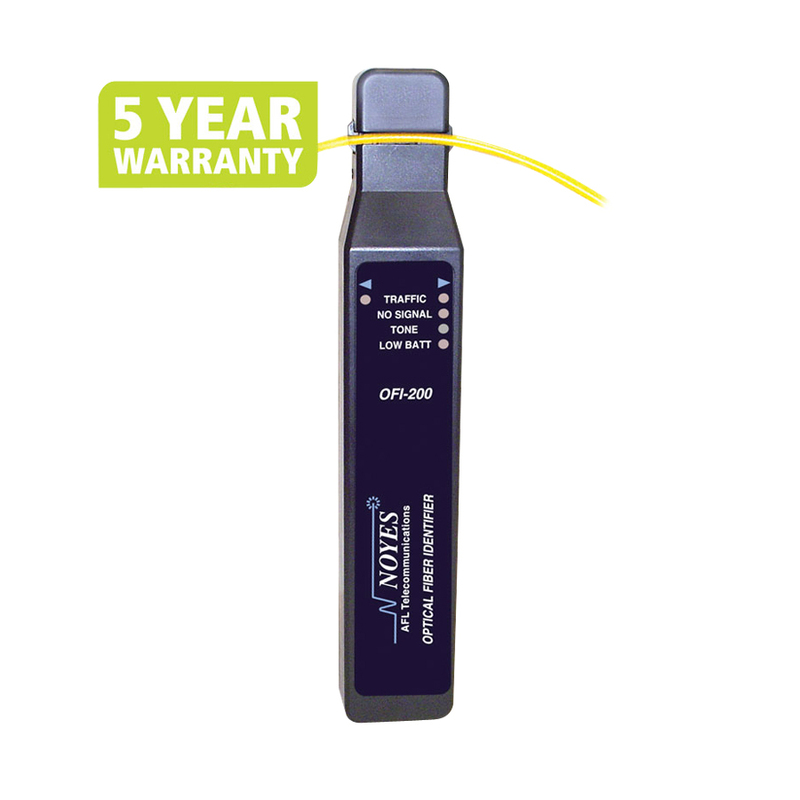 Rugged, hand-held, and easy-to-use fiber optic test instrument designed to detect optical signals transmitted through a single-mode fiber without disrupting traffic on that fiber. During installation, maintenance, rerouting, or restoration it is often necessary to isolate a specific fiber. By simply clamping an Optical Fiber Identifier onto a fiber, the unit will indicate if there is NO SIGNAL, TONE or TRAFFIC and the associated signal direction. It allows technical personnel to unambiguously identify a specific fiber and eliminates the risk of accidental disruption of revenue service. NOYES OLS7, OLS2, CSS1-SM and CSS1-MM Optical Light Sources are ideal companions for the OFI-200D. The OFI-200D is equipped with a unique two-position head design that can be configured, without tools or recalibration, to work with 250 µm, 900 µm, ribbon or jacketed fiber. The slim design of the head is particularly valuable when working in splice trays, cabinets and pedestals where work space is limited. The clamping trigger is ergonomically designed to fit the natural motion of the user's hand. A high-impact molded plastic case makes the OFI-200D suitable for use on either inside or outside plant tasks. The OFI-200D Optical Fiber Identifier is battery operated and, thanks to an automatic power capability that maximizes battery life, can perform thousands of tests before needing battery replacement. A low battery indicator is also provided.